Today I’m going to review a program called Crypto Investments, which joined Golden Stage on DavidNews.com monitor on the 28th of October. Even without reading the company biography I can tell you it’s going to be about cryptocurrencies. I guess you might have also thought about that after hearing the name of this HYIP. The project has been online in total for 19 days. Now I have reinvested in this program $400 and will keep you updated with the payment status on our monitor page. Just to give you a brief introduction of the investment plans and rates, so you can already decide after reading this paragraph if it’s worth reading the whole review of this HYIP. Crypto Investments is offering 5 different investment plans with fixed minimum deposit $1 for all plans. I assume this is a potential success factor because the admin is making it available for both type of players, beginners, and pros. Moreover, deposit terms are flexible starting from 12 days and up to 365 days. Sure, such long-term HYIP plans must have a % like long-term HYIP and this program is not an exception. Interest rates in this project vary starting from 0.6% per day and up to 2.1% per day. I would say these interest rates are very usual for a program with long-term plans. However, only time will show it this program is going to be a short or long-term project for all investors. What can I say about the project in general? Forums are silent, except the usual small chatter. Therefore, we must focus on the information provided by the admin himself/herself on the website and see what this program has to offer us! Let’s begin with the company biography, which I already mentioned in the opening paragraph of this review. 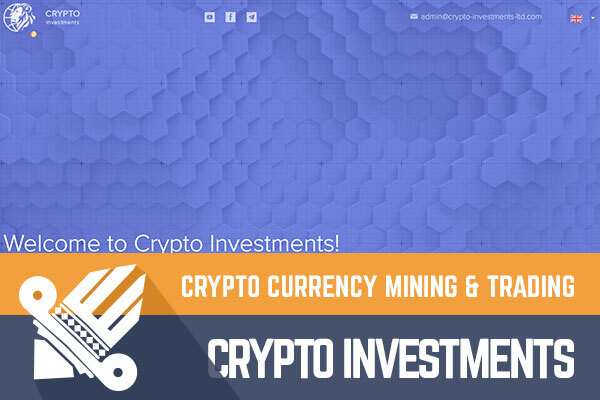 According to information provided on the Crypto Investments homepage, this project has 4 main activities – cryptocurrency mining and trading, software development and development of hardware. From the context, I understand that they all are related, and the two latter are needed for mining and trading process. Basically, you need to have the know-how, gadgets and a software. From what I have heard about the mining, it all makes sense. Of course, I don’t take legends too serious but HYIP’s with easy to understand and logical legends most likely have a higher potential to attract potential investors. We all know there are plenty of people willing to make a few bucks with referral programs. I would say that Crypto Investments is not very generous in terms of referral commissions compared to several previous programs. However, a program with 5%, 2% and 1% commission rates (standard) most likely could keep its promise paying commissions while some programs with 15% referral commissions should have difficulties keeping the money on the table after some while. I did have a quick look at the Facebook profile of Crypto Investments and didn’t find anything unusual there. I mean the program is 18 days old and you wouldn’t expect a very large group of followers gained within such short time. In fact, I have always thought what motivates people to follow HYIP profiles on social media. First, there are some programs offering free stuff. It makes sense to follow such programs. Second, if the program has been active on socials, then probably silence might be the indicator that program will become scam soon. However, it might be used totally the opposite – creating a false impression of a successful program, which has all intentions to end its activities while social media profile provides a totally different impression. Of course, my thoughts are not about this program but about HYIP’s in general. As I said, Crypto Investments has an organic looking social media profile with 31 like and several posts. The domain name of Crypto Investments contains LTD and I already expected that it is another HYIP with UK company registration details. According to information on the “About” page on the website, the company has been registered in the UK on the 6th of September 2017. I have already mentioned in previous reviews that company registration details don’t mean that HYIP is a legit business, which will keep its promise. Company registration details become a standard some while ago and ever since admins use it as a credibility factor. In the meanwhile, this procedure is not very difficult and can be done without leaving your home/office. Therefore, don’t pay too much attention to it! So, what are the potential benefits of investing in Crypto Investments? In my opinion, 365 days plan is unreal because investment term is simply too long. Therefore, 12, 20 and 30 days programs are the most realistic. Let’s choose the golden middle way - investment plan called “Crypto Transactions” for 20 days. $200 investment in this plan would have 1.7% daily revenue and the initial deposit is returned at the end of the investment term. In fact, the initial deposit is returned at the end for all 5 plans. Such deposit would make $3.4 profit a day and $68 at the end of the investment term, which is not bad for 20-day term especially when initial deposit is returned at the end of it. However, such plans have its downside because there is the probability that many people can withdrawal initial deposits at the same time. At the end, I would like to mention there is no commission fee for withdrawals and payments are processed manually within 72 hours. I believe we have had enough information about this program to draw any conclusions about pros and cons of it. Of course, these are only my thought about the program and they shouldn’t be taken into consideration as any kind of encouragement to make investments. As I wrote several times during this review, most of the things admins choose to do are there to build trust. However, we have no idea of admins intention and the state of the HYIP (cash flow, potential end date etc.). Therefore, if you ever decide to make any investments, don’t invest more than you can afford to lose! In case the start date of this program is not fake, there should be investors, which completed the investment cycle of 12 days plan. Please drop a message in the chat box if you are among the “Crypto Tech” plan investors and already completed it! Investment plans: 0.6% up to 2.1% daily for 12 up to 365 days, initial deposit returned at the end of the investment term.